Can they ignore the warranty? On 25 May 2018 I returned my hair clippers with the receipt to the store at Airport Junction where I bought them but they refused to replace my clippers stating the purchase date of 17 May 2016 meant it was out of warranty. I informed the staff that when I purchased the clippers I asked about the 5 year warranty on this item and had been told that they would honor this warranty. Imagine my distress when they refused to replace my clippers. Please assist as I was their loyal customer of many years. This is actually very simple. If these clippers came with a five year warranty then the store from which you bought the item must honour that warranty. It’s not complicated and guess what, the Consumer Protection Regulations are on your side. Section 17 (1) (d) of the Regulations forbids a supplier from “causing a probability of confusion or of misunderstanding as to the legal rights, obligations, or remedies of a party to a transaction” and I think that’s what they’re trying to do here when they say they’re entitled to ignore a warranty when clearly they’re not. The next section, 17 (1) (e), forbids them from “disclaiming or limiting the implied warranty of merchantability and fitness for use, unless a disclaimer is clearly and conspicuously disclosed”. That means that in 2016 when you bought the clippers they should have informed you that the warranty wasn’t going to be honoured. Finally, another section, 17 (1) (f), says a supplier may not enter “into a transaction in which the consumer waives or purports to waive a right, benefit or immunity provided by law, unless the waiver is clearly stated and the consumer has specifically consented to it”. I think that means they should have asked you to sign an agreement saying you understood that the 5-year warranty didn’t apply to you. I think you should go back to the store and explain this to them. Meanwhile we’ll do the same. Let’s see if they can see reason! Why won’t they refund me? Hello Mr Richard. I have surrendered my funeral policy at and they tell me stories of being given a month notice adding that they won’t refund me. So where can I get help? Mind you the policy was for five years. I suspect you’re confused about the difference between an investment scheme and an insurance policy. I also suspect the company that offered it to you probably didn’t do their best to explain it to you properly. That’s a common thing and we frequently see the consequences of people not understanding the agreements they’ve signed with insurance companies. In an investment or savings scheme the money you pay the provider is invested somewhere and with a little luck you earn some interest on it during the lifetime of the policy. When you later cash in the policy you get back the money you invested and that interest, minus any charges and commission that the provider took. However, in an insurance policy, such as the funeral plan you had, you don’t get the money back. That’s because you’re buying something with the monthly premiums you pay. You’re buying “cover” against an unfortunate event happening. Another way to describe it is to say that you are “transferring risk” from yourself to the insurance company. If the unfortunate event happens, the insurance company pays the bills. That’s how it works with a funeral plan, a vehicle insurance policy or household policy. If there’s a death, an accident or a break-in or fire, the insurance company pays to fix the problem. During the five years you had your funeral plan, if one of the people covered had tragically passed away, the company would have paid out. The fact that nobody died is fortunate for them and I hope for you too? 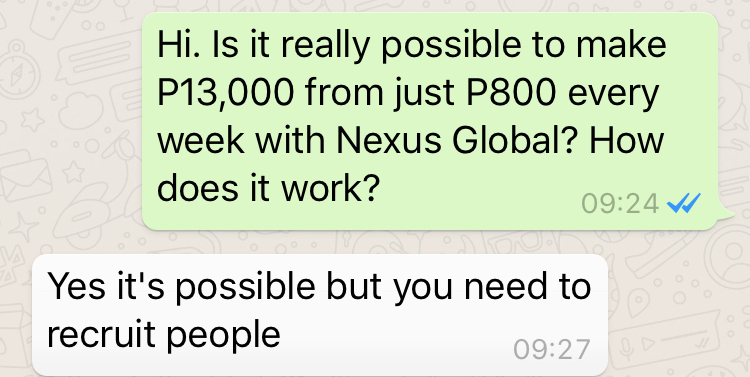 Consumer Watchdog would like to alert consumers about Nexus Global, an apparent pyramid scheme currently trying to recruit victims in Botswana. Advertisements have been published that claim that bu joining this scheme recruits cam "learn how to turn P800 into P13000 every Monday". 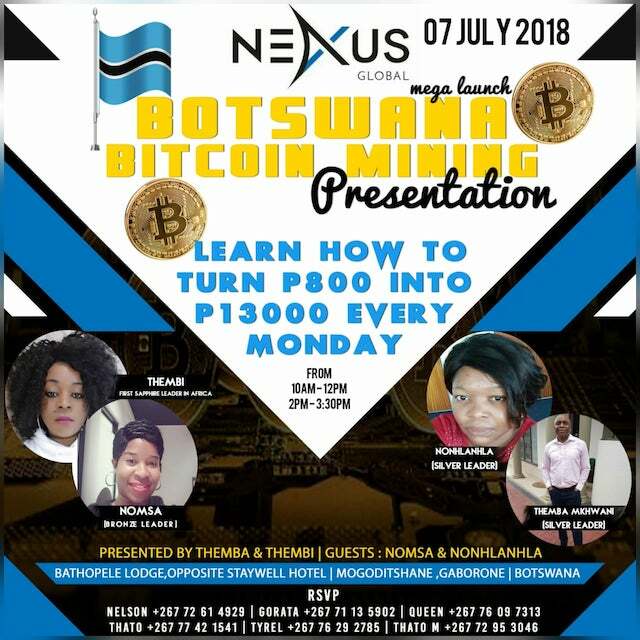 These advertisements suggest that the business is based on "Bitcoin mining" but when asked for more details the recruiters offer a very different explanation of how money can be made in the scheme. 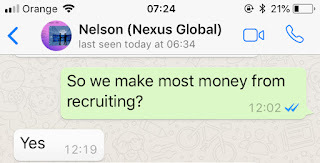 One stated that the money can be made "but you need to recruit people" in order to do so. Another confirmed that the best way to make money was simply to recruit other people. The same person then described the business structure using the following diagram. 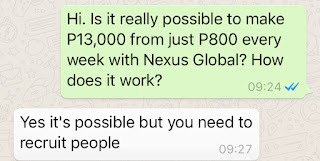 Nexus Global is clearly nothing more than a pyramid scheme as these comments and illustrations demonstrate. There are other clues that should raise consumer's suspicions. The web site for the company was only registered in February of 2018. The founder of the scheme, Christian Michel Scheibener, has a past connection to another very suspicious scheme, Omnia Tech. Furthermore, the Nexus Global web site even describes their business using a similar diagram. 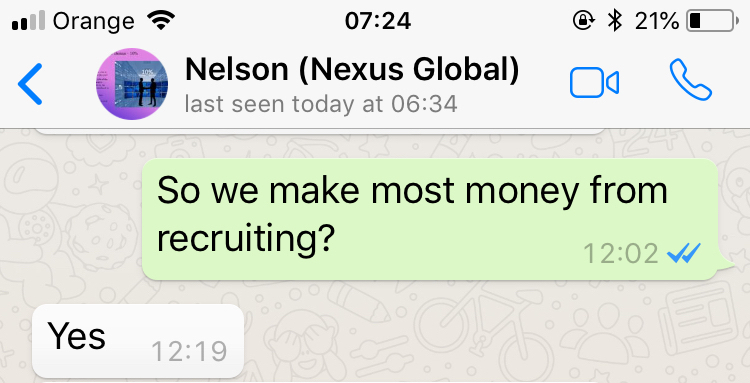 It's safe to say that Nexus Global is yet another scam that is doing its best to use references to cryptocurrency technologies to cover a very old-fashioned pyramid scheme. 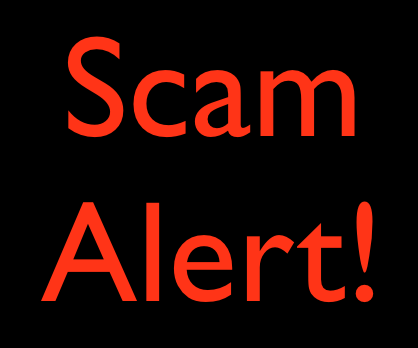 Consumer Watchdog would like to alert consumers about a growing number of scams pretending to be invitations to supply goods to Government and parastatals, including Botswana Power Corporation, Botswana Railways and PPADB. These invitations appear to be official documents and suggest that the victim’s company has been directly appointed to supply specialist goods to the inviting entity. They encourage the victims to contact a specific supplier, usually in South Africa, who they imply is the only supplier they are prepared to accept. Once the victims contact this supplier, which is actually a fake company, they demand a deposit before the fictitious goods can be shipped. We have heard recently from several companies who have asked us to investigate the legitimacy of the invitations they received and of the suppliers. In most cases we have been able to prevent any money being lost but we have also heard from victims who have already transferred the fake deposits. In one case the victim transferred over P200,000 to the scammers. Even though there were clues in the invitation documents suggesting that they were false, they are nevertheless convincing enough to have already fooled a number of victims. The fake suppliers have even taken the time to create web sites to help them appear legitimate. We urge companies to be vigilant and always to contact purchasing authorities in the Public Service and parastatals to confirm the legitimacy of any invitation to supply goods they receive before they pay any deposits. They can also contact Consumer Watchdog for free advice. We can be reached by phone on 3904582, by email at watchdog@bes.bw or via our Facebook group, Consumer Watchdog Botswana. I think the promoters are missing the point. People don't want the event "salvaged". they just want their money back and they've waited a very long time already to get it. I think that the time to talking is gone. The time is now for action. 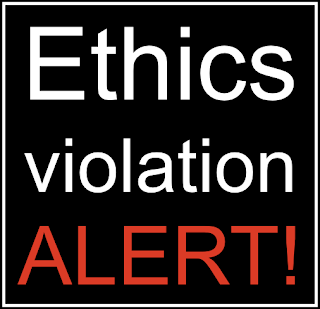 It's time for these abused consumers to seek the support of the Consumer Protection Unit and the Small Claims Court. 2. How long is the warranty? The 5-year warranty is actually hard to miss. It's there on the box. It's not complicated. A 5-year warranty is... a warranty that lasts 5 years. Insurance is about "transferring risk". It doesn't matter whether it's a funeral plan, a vehicle insurance policy, life cover or a household scheme, in each case you transfer the financial risk of an unfortunate from yourself to the insurance company in return for a monthly payment from you to them. If the unfortunate event happens (a death, a car crash or a burglary) the insurance company pays the bills, not you. The question is this. If the unfortunate event doesn't happen, are you lucky or unlucky? You're lucky than a bad thing didn't happen but unlucky that you didn't get a return for the premiums you paid. Would you rather the bad thing had happened? The “Waste Management (Plastic Carrier Bags and Plastic Flat Bags Prohibition) Regulations 2018” have been passed and this means that with effect from 1st November this year, plastic carrier bags will be banned. We have been warned! The award being offered is apparently called the “Lioness of Africa - The Fire of Botswana 2018” and comes from the Africa Business Investment Group. All it takes to receive this "award" is a payment of R35,980. However, I can find no evidence that the award has any real validity. They say that they're backed by “Brodder Family Trust” but there's no trace of such a thing. None. Is this just another award scam? Ethical? NO WAY! If she's right and he forges her signature he could go to prison for up to seven years. Even if she trusts him so little that she thinks he might do such a thing, she's got problems. I suggested to this lady that she needs to find a better husband. I also suggested that she contacts the branch manager at the bank and warns them about the risk they're all facing from his potential conduct. Nothing is real here. There is no friend, there is no parcel, there is no authority in South Africa demanding money, there is no "South Africa airport", there is no "Bank of South Africa". The only thing that's real is the money that this victim has sent to the scammers. 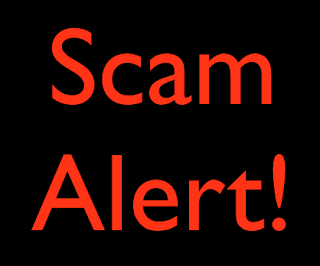 It's an advance fee scam and unfortunately, scammers don't offer refunds. 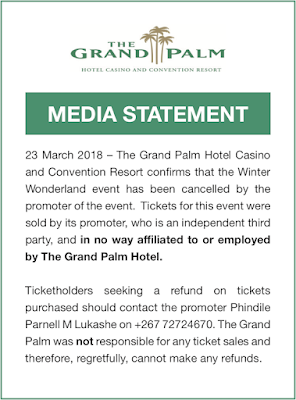 MANY people have asked us about this event that was scheduled for late last year at the Grand Palm Resort but was postponed until Easter this year and then cancelled completely. “Yes the event has unfortunately been postponed yet again pending confirmation upon erection of the ice plant and assorted equiptment (we cannot communicate a date to customers yet again, prior to actual erection). We've been innundated with operational challenges due to supplier/ technical partner issues. In an attempt to salvage the event and not abandon the initiative (which really would change the entertainment tourism sector nationally) we've decided to resolve issues with suppliers and completely localize the venture, as opposed to being a promoter for an Expatriate company. This has tied us up in quite a bit of red tape we're trying to expeidately resolve. Kindly be advised, these set backs are in no way shape or form a result of any local partners particularly The Grand Palm Hotel & Resort as they were venue / food - beverage and accomodation sponsors. We have a data base of all customers, those whose refunds are pending and those still awaiting confirmation of deployment. I think the promoter misunderstands a few things. People don't want the event "salvaged", they're not concerned whether the organisers are local or expatriate, and they have no interest in "confirmation of deployment". They just want their money back. The question is when they'll get it. It needs to be soon. 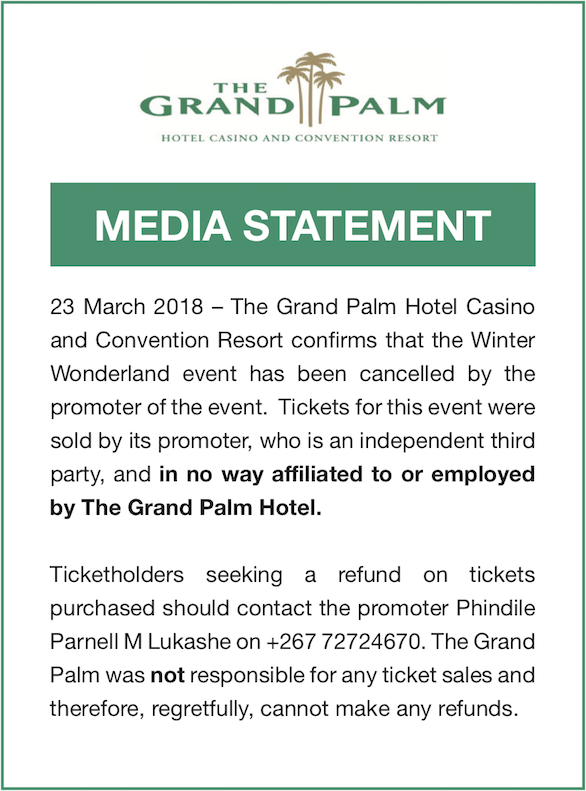 The other question is whether the Grand Palm has any responsibility for the situation. I suspect not. Can they be held accountable if someone rents a hotel room and sells drugs from it? Or if a financial advisor hires a netting room and then steals people's money? I think not. In April 2018 we heard from a passenger who was refused entry to UK because her boyfriend who lived in the UK couldn't prove that he had have enough money to sustain her during her stay. Ethiopian Airlines told us that they had been charged a detention fee of P7,000 by the UK Immigration authorities and wanted to pass that on to the customer. "Kindly note that some passengers (Botswana citizens) visiting to LHR, still come to the airport without the minimum basic required documents of the LHR immigrations, of which most passengers ‘claim’ they were not advised of such when they purchased the tickets. Be advised that, there is a detention fee of GBP10.40/per hour if the immigration authorities decide to return the passenger, which the passenger must settle. * An invitation letter, stating the purpose of the visit, the addresses of who they are visiting, also the duration of their stay. NB: Please also advise customers that they should have enough cash in hand (minimum GBP300) for any cases that might arise in the airport including REFUSAL OF ENTRY BY UK IMMIGRATION. Kindly advise our esteemed passengers in order to avoid inconveniencies and for our smooth operation." 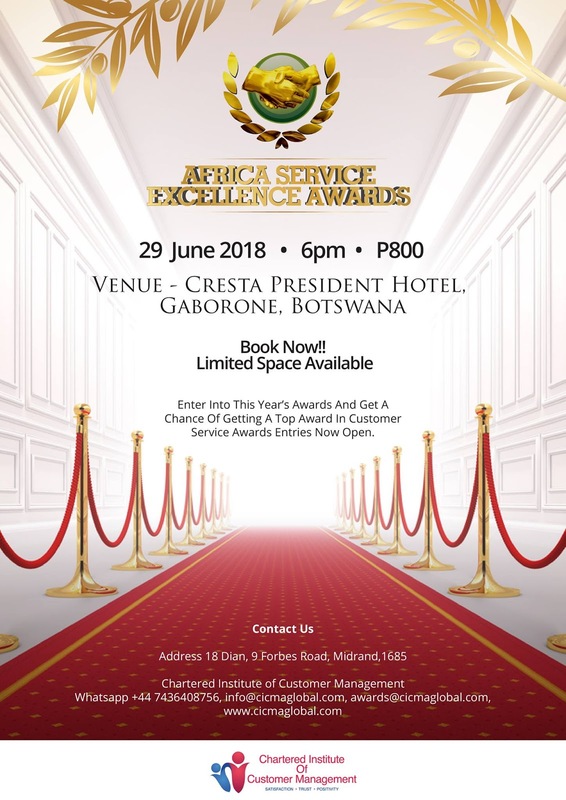 "Enter Into This Year's Awards And Get A Chance Of Getting A Top Award In Customer Service Awards Entries Now Open"
Does that mean that you must spend P800 to attend and then you get "a chance" of winning an award? You're paying for the possibility of an award? "a renowned customer service and call centre organisation with its head offices in the UK and regional head offices for Africa in South Africa." I was curious so I took a look at the addresses they give for these offices in the UK and South Africa. 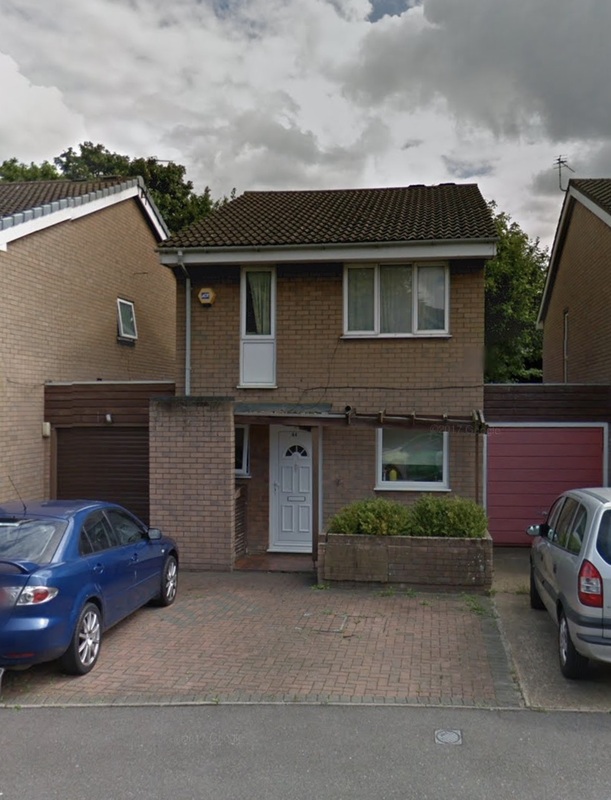 This is their UK office, an address that also hosts several other companies. 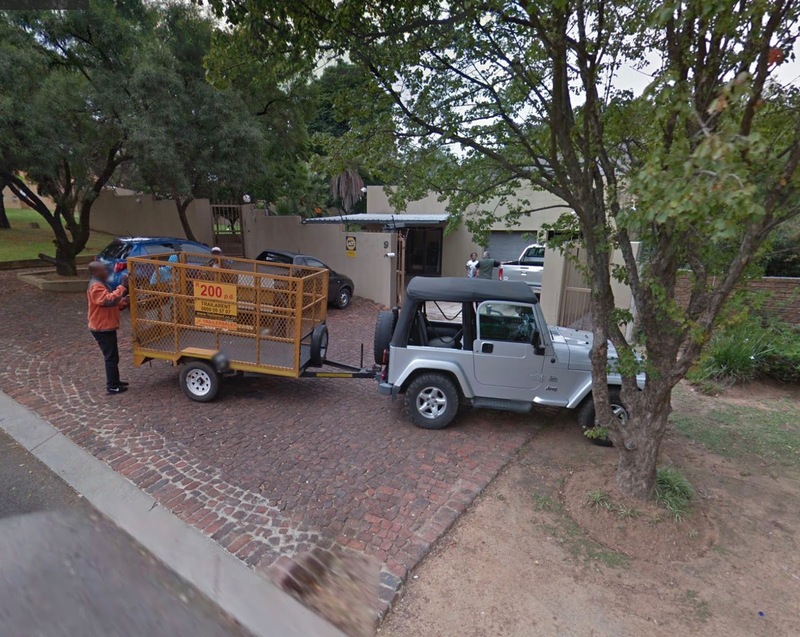 This is their South African office. It's possible this is perfectly legitimate. Just be skeptical. Why won’t the bank take me seriously? My husband gave me a loan application consent form to sign but I did not agree to sign because we didn’t discuss it before and we have other debts that we are still paying off so I didn’t agree with taking a loan now. He was so desperate that I think he might even forge my signature. I went to the bank to ask them if its possible to block him from processing this loan since I don’t agree and I suspect that he might even forge my signature. The loan sales personnel said there is nothing they can do to help me and if he forges my signature the loan will be successful. Please help me, what can I do to block this loan. Is it ethical for the bank to say they will process the loan even if the signature is forged? Ethical? I think the only ethical element to this story is your behaviour. You’ve shown that you are prudent and don’t want to get into greater debt. You’ve shown that you’re prepared to disagree with your husband and stand up for yourself. You’ve shown that you’re prepared to take action to protect your interests and even those of the bank by contacting them. You have my respect. I probably shouldn’t say too much about your husband, other than observe that he seems to need some personal financial education. You also need some protection against his potential recklessness. Sooner rather than later. 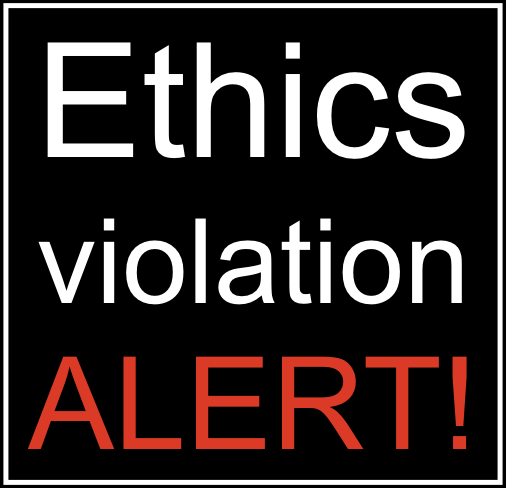 Finally, there is very obviously an ethics shortfall at the bank. Given that you’ve warned them that you suspect your husband might be about to commit a serious fraud, something for which he could easily go to prison for a long time and which might lead them to a serious financial embarrassment, I think its shameful that they aren’t taking your warning more seriously. At the very least I hope they’ve made a note on your file and that of your husband that he poses a risk to them. I suggest that you write the bank a confidential letter explaining your concerns and deliver it personally to the manager of your branch. Make sure they take your warning seriously. I have a problem and I don’t know if you can help me. My friend sent me a parcel from the UK and it is now in South Africa. From January until now they have been asking for money to clear the parcel by sending them money and I have sent them P3,000 but now until now there not here and there still asking for more money. The parcel is at the South Africa airport now. What must I do as its been a long time? Please help me and another thing is that they sent me to the Bank of South Africa as my money is there and said they want me to send them another R10,000 to my account. Is this right what the bank is doing? Readers of The Voice will know exactly what I’m going to tell you because they’ve seen this story before, many times. Unfortunately, nothing you have been told is true. There is no parcel waiting for you in South Africa. There is no bank holding the money you’ve already sent and which is now demanding more. Worst of all, there is no friend in the UK. 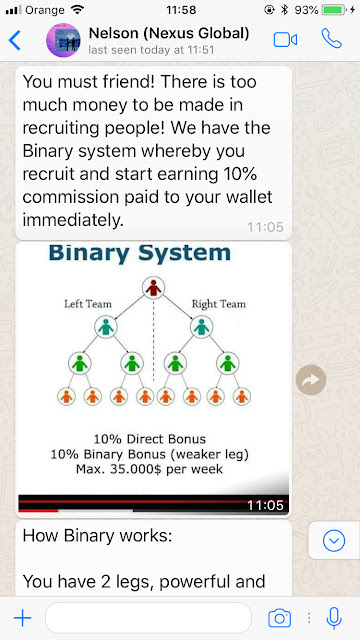 This is all a scam. Specifically this is an “advance fee scam”. This always involves a story about something valuable, either an inheritance, a lottery win, sometimes a job offer or very often a shipment like this one. However, just before the victim expects to receive this thing, the scammers demand a fee in advance. Sometimes it’s a duty or tax, other times an account opening or attorney’s fee. In cases like yours it’s a shipping cost. Whatever it might be, it’s money that will never be seen again. I’m really sorry that you came to us after you’d sent them so much money but I hope you understand not to send them anything else. Remember that scammers don’t offer refunds. My kids were chased out of school last term for late payment of school fees. One in January and the other in February/March. Now the issue is that they are asking me to pay the balance for last term yet the kids did not attend the classes. Is it fair to pay for the service that you never received? And why chase them out of school when at the end of the day you are still going to ask for the balance? Please help with advice. I suspect that this depends entirely on what it says in the agreement, the contract you signed with the school when you first enrolled the children. Unlike government schools, privately owned schools rely almost entirely on the school fees that parents pay for their children to attend. The salaries of the teachers and other staff, the power, water and internet access, the books, tables and chairs are all paid from that income. That’s why private schools often include in their contract a termination clause that says you must give at least one term’s notice if you decide to remove your child. That’s often the time it takes to find a child to replace yours. That’s how they guarantee they continue to have a steady stream of income. Your case is slightly different. As you say, it wasn’t your choice to remove your child from the school, they forced your children out because you were late paying. That’s why it’s very important that you take a careful look at the contract. I’m not an attorney but if the termination clause only refers to a term’s notice being payable if you decide to withdraw your child then there might be some “wiggle room”. 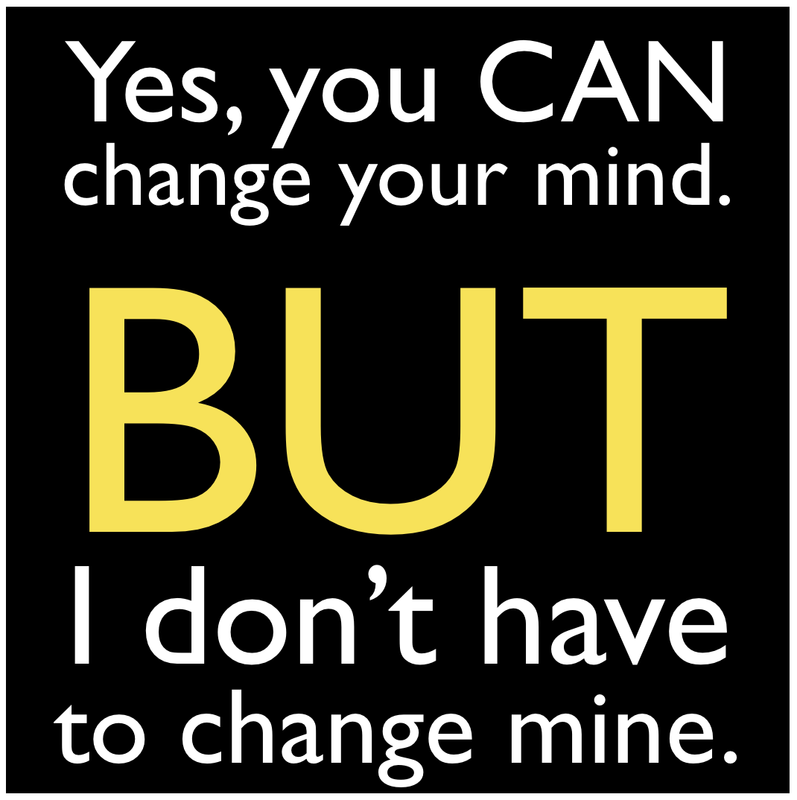 Otherwise you might be out of luck. It might also be worth asking the school whether they actually suffered financially as a result of them ejecting your children. If they were able to find other children to take their places with no gap then you might have a moral argument, if not a legal one. Hello Richard. Kindly assist me. I bought these two lipsticks at a pharmacy by Block 7 only to find out later that they are on special at another shop for a price less than I paid. I purchased them today in the morning. I immediately went back to the shop with receipts for a refund and they are refusing to assist even though I have the receipts and the goods are still sealed and still in their packaging. They say its an over counter purchase they don't return and its not even written in their receipts. Let’s start with the basics. Section 13 (1) (a) of the Consumer Protection Regulations says that goods must be “or merchantable quality” which means “fit for the purposes for which commodities of that kind are usually purchased”. If a store sells goods that aren’t of merchantable quality then they obviously must fix the problem by offering one of the three Rs: a refund, a repair or a replacement. However, in this case, were the lipsticks of merchantable quality? From what you say, there’s no evidence that they weren’t. So you have no right to return them for this reason. Were the lipsticks second-hand, used or had they deteriorated? Section 13 (1) (c) forbid the store from selling such things as new but that didn’t happen here, did it? Other sections of the Regulations forbid a store from deceiving you or from exploiting your ignorance about the product or the conditions of sale but again, I don’t think they’ve done this. From what you say, they didn’t deceive you at any point when they sold you the lipsticks so you can’t use that argument either. Here’s another thing. Something that the Consumer Protection Regulations don’t mention, a right you don’t currently have. 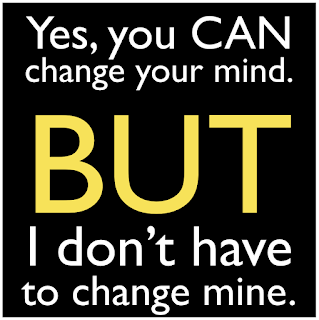 You don’t have the right to change your mind and that appears to be what you’re asking for. I know that the lipsticks are still in their packaging and that you haven’t used them but the store didn’t actually do anything wrong, did they? Did they break any of the rules that would permit you to return them? I don’t believe so. There are of course some stores that DO allow you to return unused items but that’s not a consumer right, it’s just good customer care. That’s why prices at those stores are often a little higher than at stores where they aren’t as generous. I’m sorry but on this occasion I think you’re out of luck.